Is There Still a Place for Traditional Signage? As marketing professionals we sometimes don’t attach the value to traditional signage that it deserves. There is a tendency to take it for granted, losing sight of the fact that, from a customer standpoint, it is a key communicator for our brands. The ‘What’s Your Sign?’ survey of American consumers was carried out by FedEx Office (a division of FedEx Corp with more than 1900 retail stores in the USA and Canada and a leader in small business marketing solutions) and measured the attraction power of traditional signage and its impact on consumers intent to visit a store, make a purchase and more. A sample of 914 small business respondents aged 18 and older were surveyed. The survey found a firm connection between good signage and positive consumer action, highlighting the opportunity for small businesses to grow through smart use of this simple marketing tool. “There’s no question attention-grabbing signage has the power to pick up new customers and get business moving. Effective signage is not limited to the front door. It encompasses everything from in-store materials to car clings (stickers) to posters and banners”, said Randy Scarborough, VP of Marketing for FedEx Office. When asked what is the right amount of signage, on average consumers thought a small business should have two or three signs around its store front. “Quality and quantity count in small business signs, and it’s easy to make both a reality on any business budget”, said Scarborough. Good signage is critically important. The Flange Sign, mounted on the outside of your premises serves as a beacon, telling customers and visitors where you are and is a great way to increase brand visibility. Signage is an advertising investment that you make once and it continues to work for you 24 hours a day, 7 days a week. 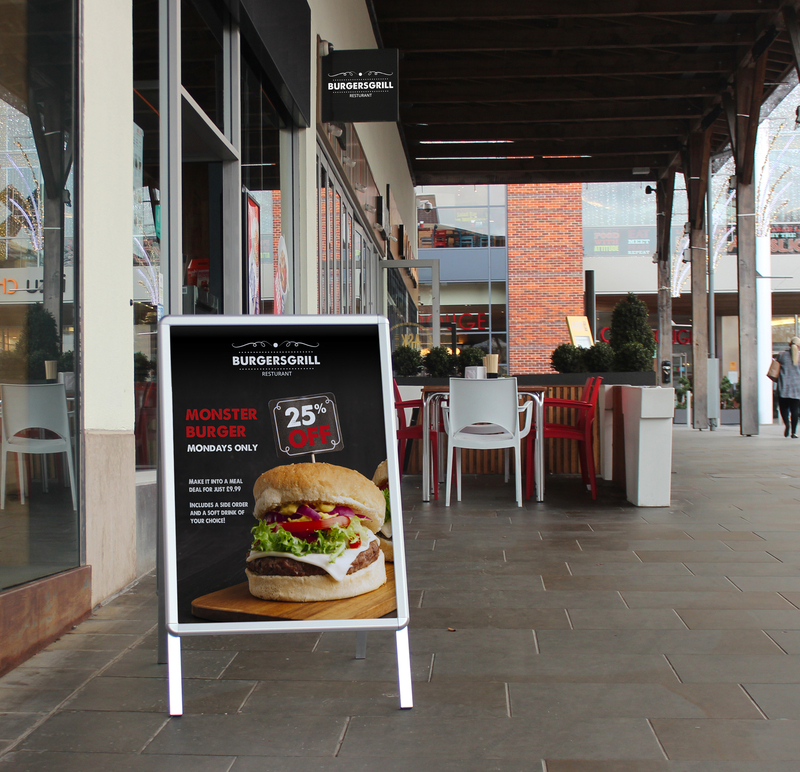 Not only does good signage drive footfall and an uplift in sales but it also plays an important role in defining a brands positioning and reputation. 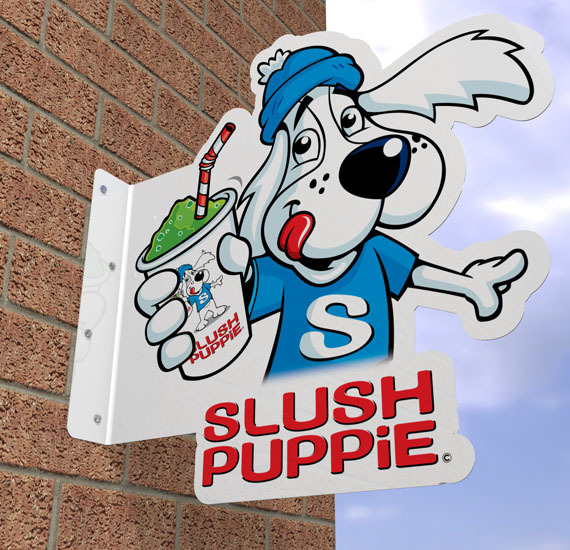 Signage plays a key role in influencing a customer’s perception of and loyalty to a business or brand. One of the biggest challenges faced by retailers is getting customers through the door, and nothing does that better than attractive external signage such as the A-Master with front opening Snapframes for quick and easy poster change. Signs are a very important part of making a great first impression and shouldn’t be underestimated. Tactical signage in the form of frequently changing imagery and marketing messages demonstrates a company’s commitment to customer service and enhances customer experience, as does helping customers to navigate your store with the use of regular, well positioned and easy to read way-finding signage. Good signage can actually compel a customer to make a purchase! Carefully considered and positioned point of sale signage influences customer purchasing behaviour and can have a dramatic effect in particular on impulse product sales. During a period of rapid digital change, when none of us are really sure about the future of television, print and social media, traditional signage is friendly, safe and trusted - and the benefits not in doubt! For bricks and mortar businesses traditional signage is as important today as it ever was, and just as important as a website. Previous Is Printed Media Still Relevant in the Digital Age?